Welcome to TFI Ministries. We are not a Church or a denomination. We are non-denominational and exist to prepare the ground for everyone who strives for mastery in the eternity race and the destiny journey. Our programmes include: 1) TWR (The Word Readers) Club 2) DMW (Drama, Music, Word) Night 3) Publications 4) Spirit and Soul Dev. Course. Welcome on board as we post from time to time God-inspired materials to help your glorious destiny, rewarding eternity and blessed posterity. Thank you. Greetings again my kith and kin, friends and fans. Welcome to Episode 7 of the weekly serialised memoir, ‘This Christian Race'. For a whole quarter I will be running thirteen episodes of it. Feel free to read, share, like and comment as the interesting novella reads on. Thank you and I love you. Episode Seven – Me, Exco? ...permit me to roughly pinpoint some spiritual highpoints in my first “missionary journey” to Ojere. That was probably the most shocking announcement I ever had in my life. Of course, with respect to putting someone in the position of spiritual responsibility. Who am I? How come? Did this people really know me? And many other questions stormed my mind. Honestly, I felt like a spiritual runt to occupy such position. Actually, a Bible version used the same word “runt” when Jesse was telling Samuel that his lastborn was in the field. Thank God it was that Davidic runt that was anointed as king. Similarly, this Abiodunnic runt is being selected as General Secretary. Those were days God used such to humble us. Ah! One needs to go back and learn from those days. Nowadays, we do permutation and combination, sizing up the position that will befit or befall us before the eventual announcement is made. God chose me not because I was perfect but because he saw in me that I was malleable. He was bringing me into a potter's house. I love the maxim: God calls the unqualified and qualifies them. At a point in my life I gave a pet name to God: Jehovah Akamiye. Wait, don’t grab an Hebrew dictionary. That name is a hybrid of two languages – transliterated Hebrew and conjoint Yoruba. You are familiar with Jehovah, right? Akamiye in a fuller Yoruba sentence would mean “Eni ti o ka mi ye” (He that qualifies me). I thank God he added the EXCOship to the spiritual training grounds concurrently running in my life at the time. It actually brought the number of the grounds to three. The number one, you are already familiar with. That is Eweje. My Eweje visitation continued every Saturday and Sunday. Incidentally, RCF was not holding a Sunday service or any regular weekend programme then. At times, I ran short on supply of my half of the transport fare to Eweje. And Mama Sho might not be in a good mood to assist. Remember, I have drawn the battle line by abandoning her much praised glorious white garment church for this Pentecostal one. So, on such occasions, I had to resort to using “heady” faith. I would trek from our home in Ijaye-Oja-Ale to Adatan park. And at the park I would repeatedly speak the drivers to carry me on “the engine” of their C-20 to Eweje for free till I would find one that would be sympathetic to my course. If eventually it is a ride on the open heaven corner, nay, popular side of a pick-up van I find to hitch, like my people will say, every form of death is convenient for the chicken. Even if you like, pack me like frozen sardines in a slate, once it will get me to Eweje, I’m okay. The second training ground is the Abeokuta branch of DCBC which the Eweje branch linked me with for continuous and progressive monitoring. I attended their weekday programmes. There I had contact with two very important personalities that picked interest in me. The first person was Rev (Dr.) S.O. Ilo, the General Overseer of DCBC, who picked interest in me to spiritually groom me up. At a point, he actually stood me up in a service and said, “You are ‘promoted’ to prayer warriors.” An unorthodox but sagacious way of motivating me to plunge myself into what he has seen in me. It was a real blessing to my prayer life which I most needed at that time. The second person was Brother Seye Owolabi. That one picked interest in me for a lifetime friendship. We did a lot of things together in those days. We were a special breed and people knew us for that. We never joined choir but we were the favourite praise worship leaders in the church. I could remember vividly how we often forced life into the no-instrument, congregation-seated praises of those times through our body parts accompaniments. You must shake and move on your seat when our rhythmic and loud hand claps entered you like a snare drum and our rhyming and matching feet taps treated you to the soothing sound of a natural bass drum hit by its pedal. At some point of the praise, we would dare the protocol and order the congregation to stand. I told you we were special breeds. No consequences followed. Somehow, Daddy G.O. had some soft spot for us. Bro Seye and I became so close a confidant that if you described us as David and Jonathan you wouldn’t be wrong. Only that he was bearing Jonathan but my own Christian name is John. So, precisely, we are John and Jonathan, J and J if you like. Sorry I’m dragging this Seye matter far and wide, we are lifetime friends, you know. Our friendship helped our spiritual lives. Imagine, if I felt I’m not right with God, maybe I’ve missed some personal daily devotions or my prayer has gone down, I would tell my friend, “Bro. Seye, maybe you should lead the praises, I'm feeling spiritually down, I won’t be able to.” My friend would always give an honest answer. For example, “Bro. Abbey, I too am not feeling spiritually vibrant these days, I’m not worthy to lead the praises as well”. That helped us to keep a check on each other’s spiritual life. But we’ve had funny moments together as well. The two examples I would cite bordered around our involvement with the prayer warrior. The prayer warriors meet every Monday night for prayer vigil. We were to sleep immediately we came so that we could wake by midnight and pray till around 3am. On few occasions, we had all overslept and woken up by around 5am. What was left? Everybody would head home straight. No need for interpretation, we have missed it for that Monday night. Warriors off-duty! What actually went wrong on such rare occasions? Let’s do the troubleshooting here together! When we arrived in the evening, Bro. Seye and I had spearheaded discussions, activities and gist which had kept almost everybody (we were mainly youth) awake till after 11pm or some minutes to 12 midnight. That was the time we now felt we should have a quick nap before the vigil starting by 12 midnight! It turned out a deep sleep that swallowed up the entire night. And to add insult to injury, our last hope, Brother Gbenga, our coordinator, who though did not participate in the pre-midnight irrelevances with us, did not wake up at any time earlier than the 5am to wake us up, probably because he too had overworked himself in his OGADEP field assignment before coming for the vigil. So, in the end, we all woke up by 5am. Up J and J! We knew we had played a key role in the misadventure of the night. Lord, have mercy, and deliver youths from youthful exuberances. At some other times, though, we might be the one that would save the day. Okay, there was this occasion that our coordinator was the one in front leading us in prayer. We were all kneeling down including the coordinator himself. At a juncture, he led a prayer point. We prayed and prayed. Minutes and minutes ticked away on it. No “In Jesus' name we prayed” Ah! Ah! Which kind lengthy prayer be this. We were beginning to run out of lexical elements to pray it any further. Words like: “Baba, Baba o”, “Oluwa, se, se, se”, “Ah, Emi-Mimo, Emi-Mimo” and non-stop tongue-blasting eventually took the centre stage in our prosecution of the prayer. My friend began to suspect a foul play. He stood up while still uttering his own fill-in-the-gap prayer cliché. He stylishly moved close to where our coordinator was and clapped his hands suddenly and loudly as if moved in the prayer to do so. Almost immediately, what we had been waiting for came from the waking voice of our coordinator: in Jesus' name we prayed. We looked at each other in a knowing way. We understand. Don’t you. Now to this emerging third training ground: RCF Executive Committee (EXCO). The fellowship meet on campus on Wednesday and some other two weekdays off campus for Bible study and prayer meeting. We go once a year to Redemption Camp for a national student meeting involving RCF in all campuses across the federation. It was on one of such national trips that I had my legitimate after-salvation water baptism at the Redemption Camp. Thank God for the brother that emerged as our president. He was way ahead of many of us spiritually. The first time I would see him minister was when we had an outside invitation to minister in drama. We were both flour members then. He was just to preach a short message in the play. I remembered vividly, he talked about Nimrod being a mighty hunter before the Lord and he swept me off my feet. That was Bro. Muyiwa Olusanwo. Spiritual naivety at its peak. Honestly, time will fail me if I am to dabble into all the values RCF added to my Christianity. Do I start with the mention of my first contact with Pentecostal prophesyings that usually came through our beloved EXCO member, Brother Taiwo Sogbesan. His prophesying form started in the way of a sudden and spontaneous heavy breathing, followed by a body vibration, then the loud subconscious divine declaration, and after the divine complimentary close like “peace be unto you”, he would fall flat on the floor as if when the Spirit took His immediate leave of him, he had no more strength remaining in him for standing. Thank God for those accurate prophecies. But those his falls often terrified me. What if he hurt himself? I’m sure he too would have been bothered. God do answer prayers! After some time, he began to deliver those same powerful messages in a calmer mien. I suspected he had received grace in the place of personal prayers and petitions to freely yield himself to the Spirit when He comes and no longer struggle with Him that would warrant such forceful demonstrations as the Spirit took it by force. Time, Oh Time, thou art no friend but foe. Please, permit me to mention this one more of how an SS brother's testimony of a drug-free year challenged me to divine health. That SS brother was Bro. Ibrahim Bamidele, the fellowship president that just handed over to us. Yes, SS. Senior Secondary ke! I mean, he was a sickle-celled individual: a sickler in Nigerian parlance. If I could remember, it was in a vigil he shared the testimony that not even a “chalk” of paracetamol touched his mouth throughout the year. I was seriously challenged. As these three training grounds intensified efforts on me, my spiritual life improved by the day. One evidence of my spiritual improvement was how God personally led me into a three-day marathon prayer for the first time in my life! It was the first and yet the easiest though done in a very challenging situation. Need I remind you of the stress, load and tension of being an Ojere SLT student? Then you need to consult episode 6 for some background. The fasting was during the week and when the school was in session. With the empty stomach I would rush to get to school early enough in the morning. On the empty stomach I would do all the tedious class activities and laboratory practical. And when we were released around 5pm, it was on that same water-and-food famished stomach I would trek from Ojere to near Iyana Oloke, Onikolobo before getting a taxi home. I tell you it was God. God was really grooming me and turning every place I incidentally or accidentally find myself a ground for growth. My IT place inclusive. Benefit of the Doubt - What if It’s not What I Think! How can I handle evidences that look so real as to putting pressure on me to make damning conclusions about people’s actions? Imagine you passed through the field and saw Shamgar holding an ox-goad. What would you tell the people at home? That Shamgar was ploughing with the oxen. Wrong! Rather, he was making war with the ox-goad. It was an abnormal use but that is the truth – Judges 3:31. The proving is not for the purpose of crucifying the person as I earlier said but with the purpose of correcting him in love. Love will only make a cane out of the fault to correct and not a cross out of it to crucify. Don’t hold on to the fault as a constant weapon for cheap blackmail or a perpetual tool to display superiority complex. This is one of the practical meanings of the scriptural saying, ‘Love covers multitude of sins’. Even God will chastise us mainly with the purpose of correcting us in love. Greetings again my kith and kin, friends and fans. Welcome to Episode 6 of the weekly serialised memoir, ‘This Christian Race'. For a whole quarter I will be running thirteen episodes of it. Feel free to read, share, like and comment as the interesting novella reads on. Thank you and I love you. Get me right here, I beseech. The course, like every other course, was good. But, I stumbled at it and picked it blindfolded. I cared nothing about its meeting point with my configuration and calling. A big mess of it I made when I came face to face with that golden opportunity of choosing a life career through the form then. That came back to haunt me. Course or no course! And irrespective of how you get there, a campus life is a campus life. It is an ocean of wide-ended opportunities that non-circumspect and naive, as well as wise and experienced swimmers may not be guaranteed a safe haven. It has so much virtues to make you as well as vices to mar you. It is a world of equal opportunities. But the enemy of man's soul has increased his activities so much that the scale seemed to have largely been tilted towards the vices part these days. It is so much pity that on our campuses, campus prostitution and all other forms of immortality, and its twin brother, criminality and cultism, have taken the centre stage to become the beehive of activities, pushing genuine academic pursuit to the background. Lord have mercy. All such hues and cries about campus vices were very much available on the 1995 Ojere campus I was entering into. But God used my conditions to help me navigate this stormy water circumspectly. Yes, I mean conditions. Different conditions, garnered from the different strata, I mean aspects of my life, converged to dictate the pace, space and place in my Babylon sojourn. I must admit, in my naivety, I never purposed in my heart like Daniel who found himself on the campus of the Babylonian University. But God was still faithful to keeping me from the defilement of the king’s portion through these conditions. One newspaper cartoon I can never forget was a piece in which it was conspicuously captured on a corner-board of the cartoon box: no condition is permanent. The cartoon character saw this and queried in pidgin: the condition wey make crayfish bend nko (how about the condition that caused the crayfish to bend). Very funny to me then. On a second thought, I think the import of the cartoon is that we must admit that there are some conditions in life which are meant to last a lifetime. So, the conditions I will be highlighting as helping my campus life are a mix of both the lifetime and short-term conditions. My first condition was the salvation condition. Though it was latent for most of my secondary school days (the most successful aspect of it being the resolution to write my WAEC without spying on other people’s work or asking them), the recent Eweje experience is fast activating my spirituality at all fronts. In short I was basking in the euphoria of my rejuvenated faith when Ojere came on me. Thank God. It was a perfect timing. Remove the Eweje episode. My spiritual life would have moved from the secondary school latency and struggle to a complete halt for nine months. From once-in-a-week reviving school fellowship to nine month spiritual wilderness. And what would become of me if I had entered into the campus directly from that condition is better left for the imagination. In my state of flourishing faith it was not difficult for me to quickly get attracted to a Pentecostal student fellowship. And that was RCF: The Redeemed Christian Fellowship. How it had to be that one out of many fellowships on campus I can’t remember. Even my first contact to the fellowship is lost in my memory. But it is ordained that that would be my fellowship, even when I happened to come back for my HND. God willing, we will still have time to talk about my fellowship and my Christianity on campus. It was the month I would be seventeen that I landed on the shores of Ojere. (Please, pardon me, the name of the community a campus is situated often swallows whole the name of the institution. The name of the locality becomes the unofficial name of the school in the mouth of all and sundry. So, Ogun State Polytechnic, now Moshood Abiola Polytechnic, has become Ojere in the mouth of everyone, including myself and this my write-up. 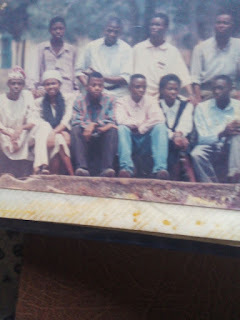 Please bear with me) Do you still remember the Abiodun of small build and young face of Lantoro High School! (Nay? All you need do is consult the previous episodes). That was me. Not much has changed. I was young, funny and playful: that was the picture of the baby of the campus. Even if I would feel like doing something untoward, I would have to think twice. The words and reactions that would follow would eternally make me regret coming to campus at such a young age. But am I really underage? I often wondered. I had to when I considered the way people treated me. For crying out loud, I’m just two years short of the ideal age expected on campus. Let’s calculate it together now: 6 years primary school entry age + 6 years primary school + 6 years secondary school + 1 minimum year space between WAEC and admission = 19 years. Just two years short. Am I really that underage? I often lamented. It is a condition people often took advantage of but not towards vices. It is a condition that made me pocket excesses that may be dying in me for expressions. Couple that with my sexual naivety, do you think it would be easy for me to approach those older and bigger girls to come and be my girlfriend? That is even if my spiritual frame does not first of all condemn the conception of such ungodly thought in me. Definitely, you would say the calculation may be different for someone from a well-to-do home. For irrespective of his age, ladies would flock around such. Sorry! I didn’t have that luxury either. Mama Sho, the sole caregiver for all five of us, her contributions to Wole Soretire's children, was a struggling primary school teacher. Those days, primary school teachers were poorly paid. Even with that meagre monthly take-home, she ensured we lacked nothing essential to our physical, social and educational development. That was evident. My schooling has always been on her bill. Ojere would not be any different. Knowing my background, it would be great wickedness extorting her to spend on frivolities. I never did in secondary school days. I would not want to start that now. There were even many occasions then that I would be so concerned that I wouldn’t want to ask for things we needed in school only for her to discover almost too late. She would scold me for it but I knew deep in her heart of heart she appreciated my childish display of concern. Our food may not be rich but it was never lacking in nourishment. I remember those days of “pademi-nigunpa” soup (sort of flooded or waterlogged waterleaf soup). The Eba usually finished before the soup. Then it was time to relish that special moment of raising the watery bowl and pouting to meditatively sip in the tan sauçe. What her honest labour provided we ate with joy and her early years stint as a food vendor helped her. She easily manipulate foodstuffs to provide great varieties for us within the limits of her means. No wonder her grandchildren later termed her Mama Kashopy (Food Wonder-woman). That woman was great. Despite the large family and her teaching career, she was still climbing the academic ladder, her limited means notwithstanding. Starting as a grade II teacher, she updated herself through ACE and finally bagged her NCE when already a grandmother and was gradually smelling the last lap of her civil service years. She had a great heart of learning. I had no option, I had to face my studies too. The opportunity she was deprived of in her post-primary school days she was spending the last drop of her strength to provide for us on a platter of gold. I would be doing myself a great disservice wasting it on campus frivolities and encumbrances. Well, our economic situation and my unpolished fashion sense combined too to make my campus appearance not too attractive. I cannot forget in a hurry this shirt and trousers I was fond of. The brown trousers belonged to my brother, Brother Ade, who left it in his wardrobe when he travelled to Niger looking for greener pastures. I tell you, that trousers was uncomfortably baggy, a bit taller and its waist swallowed mine. I couldn’t do anything about the bagginess but a belt always came in handy to solve the other two problems. Having used the belt to gather the trousers waist together in unnatural pleats, I would fasten it high above my waist to effortless tackle the length challenge. When I wore it on one suede-skin industrial-shaped shoes given to me by God-knows-who, you would be tempted to mistake me for a clown. Wait! Let me describe the shirt before you throw yourself or you are thrown into a fit of laughter. It was a real “to-match” with the trousers. I picked that too from my brother's wardrobe as well. You would think they threw me into it. It was a silk-material-custom-made shirt. The sleeves were massive. The cuffs were very long, expected to be folded back into two and held together by cufflinks. I’ve never used a cufflink-shirt before. Yours sincerely, I allowed the long cuffs to be, stretching freely and abundantly to my wrist. And ignorantly I would just button the cuffs together at the ends, one lying on the other, like every other shirt I was using. Shirt na shirt now! I think the trousers eventually forcefully sacked itself when it embarrassingly split open down my buttock's line of divide. I had climbed a locker to write an early morning fellowship programme advert on the corner of the chalkboard in one of the classrooms when the snap-accident occurred. I walked awkwardly thereafter, like someone whose thighs have been glued together, praying hard nobody would see my open boot. I think I rushed back home immediately. As for the shirt, I got tired of it and dumped it when its teeth were beginning to show outside. I mean, the colour was fading. The final condition space would afford me here was the course factor. Two courses were available in the school of pure and applied sciences. The fully developed of the courses, that is, one that offered both OND and HND, was Science Laboratory Technology, my course. The other course, Food Science and Technology, was only an OND course in our days. If you are coming in to the school, the last building you will come across before getting to the admin, the end of the school, is this same School of Pure and Applied Sciences. This so much fact, how does it connect? It is simple. My school, or what you will call college in the university setting, is the school 2 of Ojere. And my course, is the school 2 of school 2. All other students called us that name indeed for no fun. Our social activities and involvements are drastically reduced or even non-existent. Socialising is a luxury that might end up too costly an ingredient to combine with our studies. For example, while other departments were selling handouts, ours stood strictly their ground on the no-handout policy. Every note is dictated in class and lectures are near perfectly attended by lecturers. It did not stop there. There were practicals in the evening that would extend to 5pm. And at that time, no more taxis on campus. We would trek about four to five kilometres to town, that is, Iyana Oloke, Onikolobo before we could get a cab to convey us to our respective destinations. Yet, we must arrive early to school the following day. That was our daily artillery. More so, the OND syllabus of SLT was too voluminous and jam-packed. Some of the courses made it looked like we were combining Cambridge A level with SLT proper. Yet, some of our lecturers with sadistic tendencies would not spare us if we did not exhibit academic progression to their taste. At a point, SLT became to us: Stress, Load and Tension. All these put together helped the serious ones among us to maintain focus. I was one of them. That much said about helping conditions, permit me to veer off that line to roughly pinpoint some spiritual highpoints in my first “missionary journey to Ojere. See you next week for episode 7 – Me, Exco? Greetings again my kith and kin, friends and fans. Welcome to Episode 5 of the weekly serialised memoir, ‘This Christian Race'. For a whole quarter I will be running thirteen episodes of it. Feel free to read, share, like and comment as the interesting novella reads on. Thank you and I love you. Episode Five – Ojere, Here I Come! Honestly, I saw it as a suicide mission. They smiled at me and tried to explain. But that explanation never ‘entered into my head'. Considering my background, you should not expect anything different. The white garment church I hailed from did not have much to offer me with respect to voluntary fasting. Not that I was not engaged in fasting then. In fact, I had been fasting right from my primary school days. But that would be seven days of “non-marathon” fasting. Hold that thought! Before you heroicise me I need to quickly add that it was a once-a-year annual ritual. Those seven days are the last seven days of the forty-day Lenten fasting annually observed across Christendom to “relive” Jesus’ forty-day ministerial fasting. My church believed, like the Catholics, that the concept of Lent is all about suffering with Jesus. Clearly, we have been doing that all through the year by walking bare-footed to every nook and cranny in our flowing “sutana”. So, somehow, anyhow, we arrived at this elimination by substitution method of solving the Lent equation: the quantity of our bare-foot suffering per year equals to thirty three days of Lent fasting. Invariably, our Lent is a seven-day Lent. Quite easily done, QED! My information source? Mama Sho. I never cared to verify. As far as I was concerned, Mum was an impeccable and unimpeachable source in matters relating to the church. And at that tender age I wanted to be faithful to our shortened version of Lent. Unsurprisingly, Mama Sho was always there to encourage me. She supported me in both material and non-material ways. Mum was teaching in School 1; I was learning in School 2. It was in a two-in-one primary school called Lisabi Primary School situated in Ijoko, Abeokuta. So, during the long break, I would come to her, get myself to a corner in her classroom, kneel down and pray for a few minutes, the farthest my attention span could carry. Ask me what were the contents of the prayer then. Honestly, a wisp of it never crossed my neurones now. You still care to know? Permit me to answer you like Ezekiel, “Only God knowest”. But one thing was sure, I prayed. After the now-lost-treasure prayer session, it was high time I dug into the table Mama Sho had prepared before me in presence of my ... I tell you, always a full (running over, I mean) course meal: from the appetiser, various fruits; through the main course, the teacher-specially-loaded food package from the school food vendor; to local dessert, complete in itself as roast groundnut and popcorn slug it out in a coned paper, garnished with balls or blocks of “tanfiri” (roast corn, ground and sweetened). I bet if the spirit would not lead you to fast, the gourmet lunch would tempt you to. That was all I knew about fasting, I mean the voluntary one. The other type of fasting I was familiar with was involuntary, the spirit-assisted one. When the spirit spontaneously takes possession of one of our prophets, a “mountain” experience, like that of Moses, results. (I’ve heard of one prophetess that was turning her food on fire when the spiritual arrest came; she got to church holding the ladle in her hand.) Such a one will remain in that spiritual altitude for days, usually three, seven, fourteen or twenty one days which almost always comes with the concomitant spirit-assisted fasting. When Mama Sho (remember I said she was a prophetess of repute in the church) went on such spiritual pilgrimage for twenty one long days, that became the longest marathon fasting I ever witnessed. Though she claimed some spirit beings brought her food in the spirit realm on which she was sustained, we neither saw the beings nor ever caught a glimpse of some food crumbs around her mouth throughout the period. The claim to eating the angelic manna notwithstanding, she emaciated so grossly that you would think a walking skeleton was around the corner. She should definitely be; the body needed visible food, you can feed the spirit to the full with spiritual food for all it cares. Despite knowing she would not eat them, every now and then, church members still brought fruits, surrounding her with so many of them as she lay flat in a front corner of the church altar, that is, when she was not delivering one heavenly message or the other to some people at the seated position. Fruits, fruits, fruits! That was the fringe benefit for us the young ones, most especially, the reigning prophetess’s own children, in a time like this. I would eat fruits like no man’s business. Who no like awoof! My favourite fruit was banana. Between me and the monkey, getting the greater lover of banana might prove a bit difficult. In no time, my time in Eweje ran out. It was time I reported to Ojere for my OND in Science Laboratory Technology. But then, I had just spent few months in Disciples of Christ Bible Church, Eweje, my spiritual cocoon. Ah! It is glaring I need a complete metamorphosis, not an incomplete one, else I would leave a larva. Something must be done. Hey presto, God came to my rescue. He dropped a brilliant idea in my upstairs white-and-grey matter. And Pastor Tunji welcomed it. I would be coming to Eweje every weekend, from Saturday to Sunday, to render my service to the church, nay, to bring myself under God's hatchery for the spiritual making process. And not only did the church buy the idea, they took a step further to encourage me: they would sponsor the “to” while I should busy myself only with funding the “fro”. It was okay by me. What they were offering was a sacrifice. The church was not that of a buoyant economy, in the first place. So, my journey to the campus of a tertiary institution began, God having taken care to provide a strong spiritual background for me. Sometimes, I feel as if I am the one God loved most in all the world. Just a thought, no offence intended. Therefore, as I landed in Ojere, no one needed to catch me young, I was already in a strong fishing net of a beloved fisher of men called Adetunji Badejo. But, honestly, I need to take a detour to hint at how I arrived at the choice of Ogun State Polytechnic out of all the institutions on “PolyJAMB” (Monotechnics, Polytechnics and Colleges of Education Matriculation Examination) brochure, and that of the course Science Laboratory Technology. Ori gb'omo mi de'be o (Destiny, route my child's path through it). What, I say, do you expect, when that was the song sung to our partially formed ears while still in the womb. Whether we have psychomotor, cognitive or affective personality is immaterial. Our educational fortune has been pre-fixed and we only come to fill the mould. So, the PolyJAMB form was nothing better than a pool coupon to me. I did a thorough “Baba Ijebu” work on it. It was a thorough gambling job. Perming number one: I simply asked myself which of the courses in the brochure will have me write maths and biology, my two favourite subjects, together with the compulsory and general Use of English paper as its JAMB subjects. My criterion defined, I set to search the brochure. Not too long I came across a course for the first time in my life: Science Laboratory Technology. And that became the course I put in for, caring less about its nature or prospect. I was brilliant, I would not need PolyJAMB anyway, I thought to myself. The institution choice was an easier permutation. I just went for the institution within the territory where I was born, bred and “buttered”. When the result of UniJAMB exams came out it was a mixed fortune. I passed but fell some few points below first choice, UI's medicine, cut-off mark. But surely it was good enough for my second choice OSU’s medicine and pharmacy. Alas, false assurance from a paper-weight connection source to UI's admission which made me set my eyes like a flint towards the premier university, and our stark ignorance about how to stroll into the second choice open door which merit and indigene policy abundantly qualified me for combined forces to rub me of a university admission that year. Like the proverbial visitor that has greeted, “Good night”, I had to make a U-turn and wake up the already settled household with, “Good evening, please is anybody still awake!” It was now time to settle down for the no bread. It was originally half bread. I unwittingly gambled it down to no bread. Greetings again my kith and kin, friends and fans. Welcome to Episode 4 of the weekly serialised memoir, ‘This Christian Race'. For a whole quarter I will be running thirteen episodes of it. Feel free to read, share, like and comment as the interesting novella reads on. Thank you and I love you. Episode Four – Three Days without Food? Now, it remained breaking the inertia to approach Pastor Tunji to give me a chance at interpreting for him. There were inertias like that in the past that I never succeeded in breaking. The prominent and most recent was addressing the school fellowship even as a prefect. Well, I was not one of the main prefects. It was a second-class one. And come to think of it. Prefecture should be in the area of one's strength. This one was in the area of my dread. I was made the class prefect of the most notorious class in the school, JSS3. I wouldn't deceive you, I only went to the class once not to address the class but to assess my fear. They were unruly. The average class member was taller and more muscular than I. And in their eyes I saw readiness to slight and disobey constituted authority. These ones would damn the consequences and would not fear the repercussions. I couldn’t help sounding like the ten pessimistic spies that brought evil report of the Canaanland. Fear firmly confirmed, I chose the path of a figure-head prefectship. I saw to it that their path and my path never crossed for once in all my one year prefect misadventure. I loved my life so dearly. Now, back to this fellowship reluctance. We usually drew roster of who would coordinate the weekly school fellowship among us the Christian seniors. I was sure I could speak good English. But the perfection my mind was looking for made my heart not so sure-footed as to standing before this student audience. I started dodging my turns. Everything, both the serious and not-too-serious, sublime and ridiculous, deliberate and spontaneous, mattered enough at my turn for me to ask another person to stand in for me. Turn in, turn out, they kept on standing in for me. I had hoped I would garner confidence over time and one day find myself standing before the students to deliver a most powerful message. But that hope never saw the light of the day. This complex held my tongue so tied that I wasted the one year opportunity of making input or impact in the spiritual life of these students. Not even once did I break the inertia. Lord, have mercy! Here is another inertia festering. Since I have started talking about inertia, permit me to jump the ship of inertia past to inertia future so that I can scoop to the full my frustrations with inertia. I will later come back to this inertia present and how it was broken. It was in the maturing years of my faith in Christ. The journey was from Sagamu to Abeokuta in a commercial bus. I had the nudge, nay the pressing, to preach the Gospel to the passengers. I made a mess of it. No thanks to Mr. Inertia. I would want to open my mouth, but fear would almost immediately slap it shut. Fear of what? That the passengers would beat me up or shout me down? That they would not listen to me or give their life to Jesus? That the message may not be interesting or I may get stuck midway not knowing what more to say? That the driver may start the car tape or some passengers may start some annoying conversation to antagonise or distract me? I don't know. I don’t know what I was afraid of. Simply, it was fear of the unknown. And that was the tool inertia used to hold me dumb when I should be found speaking for my Lord. That was all I could say, nay, utter, and my mouth immediately stopped and shuttered its intention. This fear was a good sprinter. It had outrun and overrun me again. I tried again and again but it never got better than that. I watched with a heavy heart as passengers disembarked at Abeokuta deprived of the message I had been sent to deliver to them. Blood, pints of blood on my neck! Lord, have mercy. Welcome back on board Inertia Present. God helped me with this inertia of approaching Pastor Tunji. It never festered for long. Pastor Tunji was an approachable person. Has he not been coming to the dormitory to chat with us of his own volition. Somehow, I hinted him of my intention and he welcomed it. We worked the arrangement. And thank God Sister Tope was not all that a free person. She was in school in Abeokuta. So, her interpretation for Pastor was not a regular business. I had the opportunity clearly laid on a red carpet. I didn’t waste it. In a little time, I became Pastor Tunji’s official interpreter. Being that close to the word of God greatly helped my spiritual life. To be a very good and proficient interpreter, you need to be close to your Bible. One of the reasons is obvious, the Pastor and his congregation will appreciate it best if you can give it to them phrase for phrase, and word for word, offhand, from the Bible translation of the language you are interpreting to. More often than not, the language was Yoruba in my own case. But, Pastor’s frequent code-switching made me to prepare as well in English, beforehand, in order not to be caught napping. So, having common and favourite Bible verses, both English and Yoruba, in my memory became a necessity and not an option. Gradually, and by the help of the Holy Spirit, the verses started moving from my head to my heart. And I grew in leaps and bounds. Another aspect of being a pastor's boy that gave me an edge was being privy to people’s discussions with Pastor. That is, those discussions that might not require exclusive privacy with Pastor. I made good use of these other discussions that could accommodate pastor’s apprentice. For example, a brother came to see Pastor. I could remember him vividly: Brother Wale, now Pastor Wale. As we were seeing him off, he and Pastor brought up a matter very strange to me. They talked about three-day marathon fasting. Three-day marathon fasting? They talked about it freely that suggested to me they had freely engaged in it. I looked at them as if they were from another planet. I’ve never heard of that before. I couldn’t hide my bewilderment. See you next week for episode 5 – Ojere, Here I Come? Greetings again my kith and kin, friends and fans. Welcome to a bit longer Episode 3 of the weekly serialised memoir, ‘This Christian Race'. For a whole quarter I will be running thirteen episodes of it. Feel free to read, share, like and comment as the interesting novella reads on. Thank you and I love you. And as for the feminine temptation saga, God took care of it in a unique way. It was an unusual way of taking care of temptation. Permit me to call it "rumour of war" method. You should remember the story in the Bible where God made an invading king to hear only a rumour of war and he had to abandon his mission and voted with his feet. Who would not? Just a rumour of war led to the death of one hundred and eighty five thousand soldiers in one night. I'm sure if I were in his shoes I would not want to wait to see the real war when just a rumour of it has done so much damage. It was a rumour I heard too that forcefully disengaged me from my ungodly engagement. Up to today, it remained a rumour. I never bothered to confirm it. A little bird told me that my lust-entangled mistletoe, Bernice, was caught red-handed in a love-tangle with another boy in the church who was our age mate but not my acquaintance. It was under the roof of our spiritual asylum building, Ile Aabo, they were seen to be committing such sacrilege. That did it. Nay, I mean, that undid it. Indeed jealousy was as strong as death. This jealousy forced me to die! I had to die. Yes, I had to die to this sin stronghold once and for all. Imagine, the one for whom we engage ourselves in fasting to save from predicament setting his table outside having a gourmet lunch. It was painful I allowed the perfecting of my salvation dragged for what was not worth it. Even though I didn't jump on a fact-finding mission immediately or thereafter, I instantly saw my folly. If I had died in the sin-struggle of not letting go of her, then I would have been forced by the cold hands of death to let her go anyway and in addition, face the pangs of hell all alone. I came to my senses like the biblical prodigal son and finally let go. If my memory would not be failing me, not too long after, I wrapped up my secondary education in Lantoro High School. But just before we dropped our pen, we had a destiny visitor to the school. It was the principal of one Odeda Farm Institute, Eweje. He had come on an awareness campaign of a one-year general agriculture course in his Institute for secondary school leavers like us. He advised us to avail ourselves the opportunity of the course to fill the time space between the completion of our WASSCE and the eventual admission into our tertiary institution of choice. The aspect I found most interesting in his speech was that we would be boarding. Whaoh! I've never been a boarder all through my education thus far. Here is my golden opportunity to have a taste of the pudding. I grabbed it with both hands. A life away from parent! My curiosity had the better of me. And I got Mama Sho, that is, my mother, informed. Of course, my longing for freedom away from her was edited out of my presentation. Thank God, she had no objection. God worked in mysterious ways! I went to Eweje looking for freedom from parental encumbrances. But He had a better deal for me. Eweje was an experience indeed. It will need another memoir to recount that side of my life. But I will have to stay with the brief of this memoir. I was a nominal Christian for the greater part of Eweje episode. I lived my Goje life of student fun to the fullest within the first four or five months of our pilgrimage. Being together as students in a dormitory all through the day and night could not promise anything less. The experience was better than the one I could have had in a secondary school boarding house. Here, there was no housemaster, no light out and no other signs of externally regimented life. Apart from lecture and agric practical periods, we were f-r-e-e! It was in short some sort of a tertiary hostel. We fended for ourselves, food and cooking inclusive. And that comes at times with "kre" moments: moments of short or stall in supply as my pastor will call it. And we were very creative in managing such situations. Have you ever heard of jollof Eba? It was there I came across and got involved in its preparation and consumption. The recipe is simple. Just put ground, grated or cut pepper (any pepper will do) in a pot of water. Add palm oil, salt and diced onion if that is available. Heat the concoction to boiling. It is time to put your gaari and turn it to a cream. Yours sincerely, there you are with jollof Eba ready to be taken without meat or soup. But please, eat it while still fresh and hot. At times, when we get buoyant courtesy of fresh supply from the headquarters, Mama Sho in my own case, our pots get a feel of soup. And as for animal protein, we don't go to far. It is either "tapa-titan" or "mortal". I will explain before you crucify me for using foreign lingo from the Mars. "Tapa-titan" is the "technical" jargon for the head and legs of chicken which have been cut off from the chicken sold or supplied to eateries and hotels. We were there as the waste management agents to mop up the head and legs into our pot at "shikini" money. But, "Mortal" is the senior of "Tapa-titan". These are the chickens that have just freshly died from the poultry around. We were always on time to take delivery of them at a ridiculously reduced price. Whatever killed the bird is none of our business. Even if it is bird flu. Let it go and be explaining itself to the boiling water if it can. Whenever we "jam" such luck, it will be festivities for us and our pot. We tried inventing another animal protein from the abundance of strange sounding, smelling and looking bats living between the roof and ceiling of our dormitory. The adventure was a failure. Those bats tasted horrible, just like their sound, sight and smell. The only aspect of Eweje life I hated was the "face your arable" part. Cutting grass or clearing farm would never come easy for me considering my build and background. Even if suburban, I had lived in the city all the while. Eweje life sped on with speed, to be cut short three months to go with an admission offered me by Ogun State Polytechnics. But it was not meant to end uneventful with respect to my spiritual life. All along, a man usually come to our dormitory to spend long hours with us discussing about football and politics. He was so versed in many fields that one could be tempted to label him a living encyclopaedia. We called him Booda Tunji. That was all I would have known about him but for two or so months to parking my bags and baggage out of Eweje when I discovered this was my destiny helper in waiting. Booda Tunji was neither a football analyst nor a politician. Here was the committed and word-of-God-rich pastor of the only Pentecostal church in the immediate neighbourhood using one of the school's deserted dormitories for their services. It was an interesting discovery as I sat with my mouth agape watching the hitherto football analyst ministered as a guest minister in a church where many of us students had been invited to for this their special programme. The sleeping born-again giant in me instantly awoke. Indeed, the deep would definitely call unto the deep. Automatically, I gave his church a try. And that was it. My spiritual life has found a breeding ground. In no time the divine destiny that has brought Booda Tunji and I together transformed our togetherness into a mentor-mentee relationship. And so it is till date. The first step in the coming together was the title of this episode. It all started out when I sat under his ministration and his younger sister, Sister Tope, interpreted for him. That desire to see simple and correct English spoken and written jumped over me. I started re-interpreting to my heart audience what Sister Tope was interpreting to the public audience. And after the peer review, I concluded, "I can do it better." See you next week for episode 4 – Three Days without Food?